Wattle and daub: a form of wall construction, consisting of wattles, covered and plastered with clay or mud. Used in English Elizabethan period. Wattle and daub used by Romans in 1 BC. 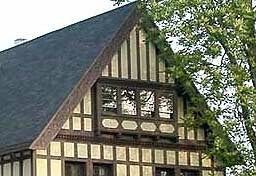 William H. Hotchkins House, 20 Lincoln Pkwy.